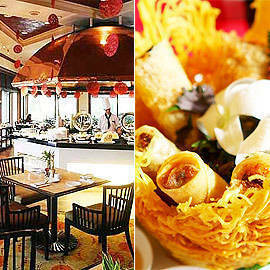 Food-trip on fresh spring rolls and other specialties from Saigon and beyond. 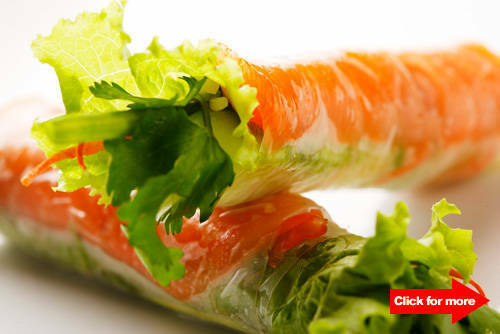 Fresh Vietnamese Spring Roll. To see more dishes, click for more. (SPOT.ph) Savor the taste of fresh spring rolls and other authentic Vietnamese eats at Café Jeepney as they bring to the table specialties by Chef Somnuk Attaworn of Charm Cham Restaurant in Ho Chi Mihn City. InterContinental Manila teamed up with the Embassy of Vietnam for this foodfest, which runs until July 14, to celebrate 35 years of diplomatic relations between the Philippines and Vietnam. The café offers a lunch and dinner buffet with fresh, healthy, and flavorful Vietnamese fare that hail from various regions: beef and black pepper from the north, spicy servings from central Vietnam, and fruits and hot chilies from the south. Among the must-try dishes include Transparent Rolls with Pork and Shrimp-shrimp, pork, rice noodles, basil leaf, mint leaf, lettuce, and Chinese chive wrapped in rice paper; Lotus Fried Rice with Pork, Egg and Prawns, a winning combination of shrimp, pork cake, carrots, green peas, lotus seeds, rice, and Chinese-style roasted pork; Beef Rolled on Lemongrass, beef tenderloin seasoned with oyster sauce, atsuete, sesame oil, Sriracha Vietnamese chili sauce, sunflower oil, bulb shallots, and rolled on lemongrass stalks; Three Tasted Soup, packed with crabmeat, pork, and shrimp; and their Banana Cake with Coconut Milk for dessert. The lunch buffet is from Monday to Sunday, 12 noon to 2:30 p.m., while the dinner buffet is from Monday to Saturday, 7 p.m. to 10:30 p.m. Groups of four adults will only have to pay for three during the festival.